A weak upper low over southern Mediterranean gradually progressing east, while an upper trough approaches western Europe. 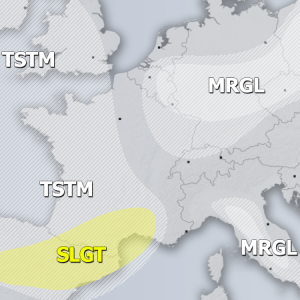 A SLGT risk has been issued for NE Algeria, N Tunisia and towards Sardinia with threat for heavy rain, large hail, strong winds and tornado / waterspouts. A TSTM+ area is places between N UK and W Norway where threat for severe winds and heavy rain exists. Area will be monitored for possible upgrade into SLGT risk on DAY 1 if conditions improve.